Robin Charles Thicke (/ˈθɪk/; born 10 Mairch 1977) is a American sangster-sangwriter, muisicker an actor. He is the son o actor Alan Thicke and actress Gloria Loring. Thicke haes wirkit wi popular airtists such as Christina Aguilera, Nicki Minaj, Jennifer Hudson, Usher, an Mary J. Blige. Thicke haes been acknawledgit for his wirk on popular albums such as Usher's Confessions an Lil Wayne's Tha Carter III an aw. Thicke wis a sangster, mentor, an judge on the ABC show Duets. Thicke wis born in Los Angeles, Californie. His mither is actress-sangster Gloria Loring (née Goff), who appeared on U.S. daytime drama Days of Our Lives, an his faither is Canadian actor Alan Thicke, who is kent for his role on the TV sitcom Growing Pains. They divorcit when he was seiven. Thicke haes a aulder brither, Brennan, who worked as a voice actor in the mid-1980s. Thicke is a dual ceetizen, hauldin Canadian ceetizenship throu his faither an Unitit States ceetizenship throu his mither an bi birth. Thicke began datin actress Paula Patton at the age o 16. They wur marriet in 2005, an hae a son, Julian Fuego Thicke, born 6 Apryle 2010. In the hairst o 2010, Thicke spent several weeks in New York Ceety recordin an livin in a rentit SoHo apairtment which he haed convertit intae a makshift profeesional studio. Thicke haes said he does no like his muisic bein described as "blue-eyed soul". ↑ Concepcion, Mariel (July 2, 2008). "Thicke Says World Needs 'Something Else'". Billboard. ↑ "Kelly Clarkson Among Singers Starring in Duets". People Magazine. March 8, 2012. Retrieved April 1, 2012. ↑ "Alan Thicke Biography (1947–)". Film Reference. Retrieved September 27, 2012. ↑ Patch, Nick (3 October 2013). "Robin Thicke dual citizenship qualifies Blurred Lines for next year's Juno Awards". The Canadian Press. Retrieved 10 October 2013. ↑ Penn, Charli (December 21, 2011). "Exclusive: Robin Thicke on Loving Black Women, Interracial Dating, and Pleasing Paula". Essence. ↑ Cruz, Anne Marie (April 7, 2010). "Robin Thicke and Paula Patton Welcome a Son". People Magazine. Retrieved November 2, 2010. ↑ "Return of the Nomad Engineer II: The Top NYC Studios of Freelancer Ari Raskin, Part II March 2011". Sonicscoop.com. March 7, 2011. Retrieved June 30, 2013. 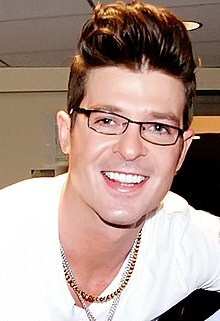 Wikimedia Commons haes media relatit tae Robin Thicke. This page wis last eeditit on 5 September 2018, at 01:56.